We all know food waste is a problem. In 2010, Americans wasted more than 133 billion pounds of food. That’s a lot of potatoes. I’m not going to lie — I recently tossed an entire container of yogurt because it was a few days after the “sell by” date on the label. I didn’t even check it first. The sad truth, though, is those dates on food labels don’t necessarily mean the food is bad. Since I’m not educated enough on the meaning of the container’s date, I probably wasted an almost-full container of yogurt that was still safe to eat. But we’ll finally get some clarification on those confusing sell-by dates. Hopefully it’ll help lessen the massive food waste problem and save us all some money in the long run. Dates on food labels can be incredibly misleading. However, the methodology surrounding these phrases doesn’t all have to do with whether food is perishable. In fact, some of them are just flat-out guesses as to when the consumer will enjoy the product most or when it’ll no longer look good on shelves. The grocery industry is finally taking steps to clarify those dates. 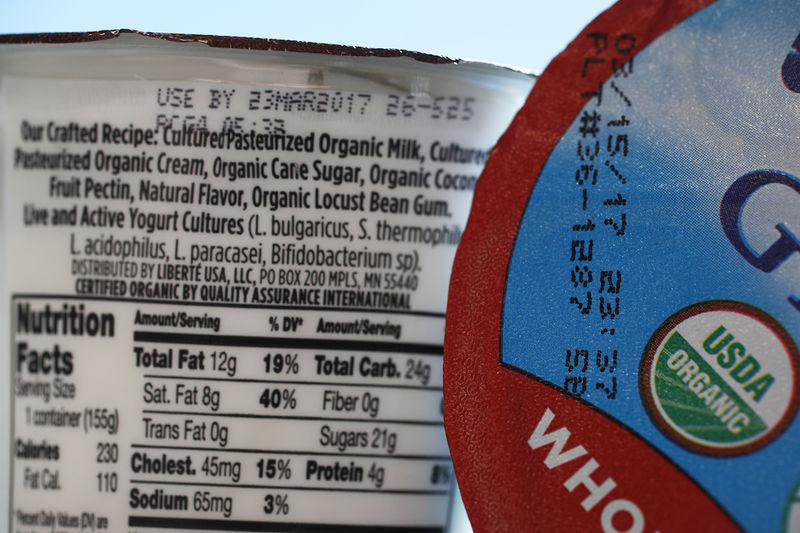 The Food Marketing Institute and the Grocery Manufacturers Association recently announced an initiative to implement voluntary standardized label regulations to halt the confusion surrounding food label dates. Manufacturers will now be encouraged to use two phrases: “use by” and “better if used by.” “Use by” will refer to food safety and be used to mark when perishable foods should no longer be consumed; “best if used by” will indicate when the food will taste the best. Grocery shoppers shouldn’t immediately expect to see these changes. They’re also entirely voluntary, so not all manufacturers may implement them. Those that decide to use the phrases have until 2018 to do so. This initial push for voluntary standards is an effort to put pressure on federal regulators, which in turn could help prevent Americans from throwing away $165 billion worth of food each year, the Natural Resources Defense Council reports. To put it into perspective, a household of four could save $1,350 to $2,275 per year just by reducing its food waste. Hopefully these simplified sell-by date labels help! Your Turn: What do you think about these new changes to sell-by dates on food packaging?